Companies spend millions creating innovative products hoping to build a secure future. Then most often they introduce those products to market…with ineffective communication. These days “digital” seems to be the go-to approach everyone chooses. Yet taking your innovative product to market with a digital release is the equivalent of whispering in Grand Central station. You think you did something – but nobody who would care about your product is going to hear you. TV Drives Demand for New Products… Longer forms of TV dramatically shorten the time it takes for a product to be a sales hit. Why? Message, demonstration and communication, along with a call to take action, ensure that consumers go to the store asking for the product. TV Increases Margins… A product on a shelf doesn’t add value to itself. So, with too many releases, lacking communication, retailers have to rely on price cuts to drive sales volume (price cuts they ask the manufacturer to pay for or share). TV can change this situation. A well demonstrated product demands a higher price – often as much as double or triple the price without TV. TV Builds Brand while Driving Demand… In our work, we find that consumers retain the most powerful brand messages when they are seen through a meaningful product. Crafted carefully, a smart television campaign will drive demand and also build powerful long-term brand value. 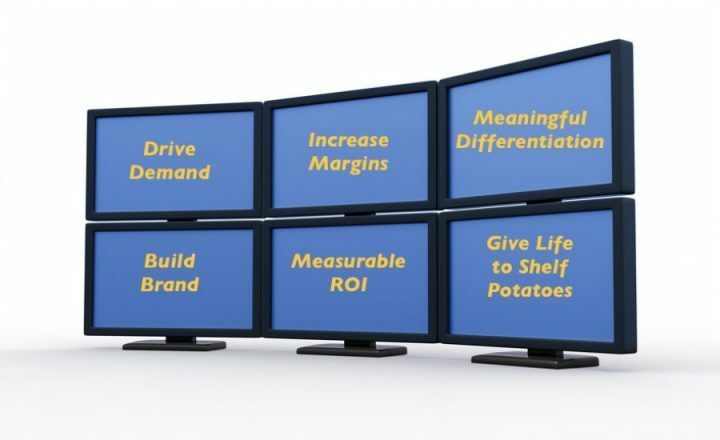 TV Brings Shelf Potatoes to Life… There’s a special type of product we call a “shelf potato” – a product consumers love when they own it, but which barely moves at retail because consumers don’t know why they should care about it. TV can bring these products alive. TV Creates Meaningful Product Differentiation… Companies spend millions creating products with exceptionally unique value. Unfortunately, companies are often years – if not decades – ahead of consumers with these advancements. Product advantages that aren’t communicated don’t deliver market power, and don’t deliver differentiation. TV Delivers Exceptional, Measurable ROI… When Atomic executes TV, we ensure that we have multiple measures of impact in place. If it’s DRTV, then we track direct response by phone or web. If online, then we track online response and turn that “information” into ROI as well as useful knowledge. And, Atomic’s highly active view of TV creates immediate impact at retail — typically within 2 weeks of initial campaign release. Innovative products play an exceptionally important role in the market – for consumers, for brands and for retailers. Yet most often they are put onto the shelf without the communication needed to achieve success. That’s where longer forms of TV come in. There is no medium as powerful as TV at driving success for innovative products.